It's almost impossible to convey the excitement coursing though Gizmodo. Ray Kurzweil, the world's premier futurist and bona fide genius, will be gracing the Gizmodo rooftop with his presence at The Sensory Effect, a special NY Tech Meetup all about the latest in gesture/sound control in partnership with Gawker Media, presented by Windows Internet Explorer. You'll also be hearing from another guy with an impressive resume: Danfung Dennis. He'll be discussing his company Condition One's ground-breaking video player. If you'd like to attend and you live in the New York City area, email your contact info to sensory@gawker.com by 6 PM ET on June 15 and you will be entered to win a place on the guest list. 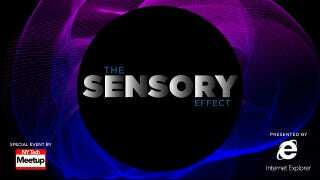 If you aren't one of the lucky, randomly-chosen winners, you can watch The Sensory Effect livestream in the brand-new HD Concept View right here on Gizmodo. Learn more about Dennis and Ray below. Head here to download Windows Internet Explorer so you can see and hear the web at its most beautiful. Danfung Dennis is the CEO & Founder of Condition One, a company that's created an embeddable immersive video player for the iPad and iPhone that brings viewers inside stories and experiences. It's the natural progression for Danfung, who is an award-winning documentary filmmaker and photojournalist who has covered the wars in Iraq and Afghanistan since 2006. His images have been published in Newsweek, Time and The New York Times. His footage in the PBS Frontline documentary "Obama's War" was nominated for a 2010 Emmy® Award. His documentary, Hell and Back Again was nominated for the 2012 Academy Award®, and won the World Cinema Jury and Cinematography Awards at the 2011 Sundance Film Festival. Where does one begin? Ray Kurzweil was the principal developer of the first CCD flat-bed scanner, the first omni-font optical character recognition, the first print-to-speech reading machine for the blind, the first text-to-speech synthesizer, the first music synthesizer capable of recreating the grand piano and other orchestral instruments, and the first commercially marketed large-vocabulary speech recognition. He has been described as "the restless genius" by the Wall Street Journal, and "the ultimate thinking machine" by Forbes. Inc. magazine ranked him #8 among entrepreneurs in the United States, calling him the "rightful heir to Thomas Edison," and PBS included Ray as one of 16 "revolutionaries who made America," along with other inventors of the past two centuries. Among Ray's many honors, he is the recipient of the $500,000 MIT-Lemelson Prize, the world's largest for innovation. In 1999, he received the National Medal of Technology, the nation's highest honor in technology, from President Clinton in a White House ceremony. And in 2002, he was inducted into the National Inventor's Hall of Fame, established by the U.S. Patent Office. He has received nineteen honorary Doctorates and honors from three U.S. presidents. Ray has written four national bestselling books. His book, The Singularity is Near, was a New York Times best-seller, and has been the #1 book on Amazon in both science and philosophy. His next book, How to Create a Mind, The Secret of Human Thought Revealed, will be released by Viking in October 2012.